Get reusable name badges for free like the one below for business and your employees with our MakeBadge badge maker. Select any blank name badge template, use MakeBadge online design software to adjust standard badges: add your logo, text, photo and print unlimited number of reusable name badges. No restrictions. Best quality – guaranteed! What Free Reusable Name Badges Can I Get Here? MakeBadge creates all sorts of name badges, including blank name badges with a logo or without it, square, rectangular, rounded reusable name badges; reusable name badges for employees or school kids; blank name badges for conferences, full color reusable name badges or cheap black and white reusable name badges and much more. You don’t need to order reusable name badges and waste your time on print & delivery. Click Get Started and design a reusable name badge like this yourself now! How to Create Free Reusable Name Badges at MakeBadge? 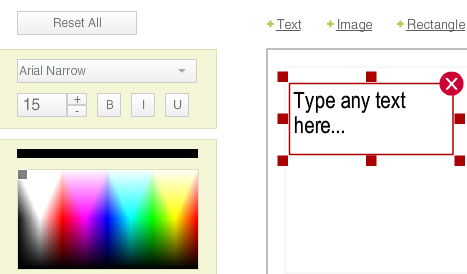 Click Get Started and in the upper left corner of the toolbar select a reusable badge type: Rectangular or Rounded. Or in the upper right corner of the toolbar, choose a blank badge template for further adjusting. Then specify a reusable badge size by clicking the upper toolbar option called Badge Size. Find a suitable size in the drop-down list. Here you’ll see such popular reusable badges dimensions as: 85 x 55 mm (3.35 x 2.16 in); 88.9 x 50.8 mm (3.5 x2 in). 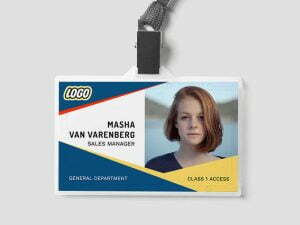 Decide if you want to print a colorful reusable name badge or more modest and cheaper black and white version. Click Background Color if you want to switch to the full-color mode. Upload your logo by clicking the +Image button if you are looking for a reusable name badge with a logo. Keep your logo dimensions small, so MakeBadge badge maker can process it faster. Add a text with a company/school/conference name or a job title by clicking the +Text option. Don’t forget you can always change the font color, size and style. Add a blank rectangular using the +Rectangular button and specify its color if you want a person to write its name manually. When you are done, click the Print button and print any quantity of reusable badges. We recommend you to print several versions of reusable badges. 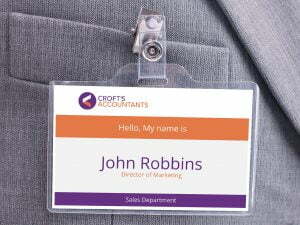 Compare your name badge templates quality printed on an inkjet printer or laser printer. Our tests show that such models as HP LaserJet print excellent reusable badges even if they made at home or office. Obviously, reusable name badges must be durable enough so survive as long as possible. Please laminate your printed name badges or put it into a plastic badge plate or a name badge holder available in local office supply stores. Get reusable name badges now at MakeBadge!